Join us on July 21, 2019 for the 19th annual Titletown Bike Tour! NEW 2019 - Group Registration Options! Sunday July, 21th -15K, 35K, 55K, 80K, 100K, 100 Miles! Online Registration will Close July 15th at midnight! Sunday, On-Site Day of Registration will Open at 5:30 a.m. Enjoy a scenic ride through Northern Brown and Southern Oconto counties with routes ranging from 15k up to 100 mile Century. The ride begins and ends at United Healthcare in Howard, WI. Routes for all ages and abilities to choose from; 100 Mile Century, 100k, 80k, 55k, 35k, and a family friendly 15k. Themed rest stops are located along the way with great food to fuel your ride and SAG support. All Routes are one price, with paid participants receiving a gender specific, event shirt with their registration. *Shirt not guaranteed after June17th so register early! Children 15 and under ride free but must be registered and will not receive an event shirt. After your ride, enjoy food, music and raffle prizes, and share the stories of your ride! 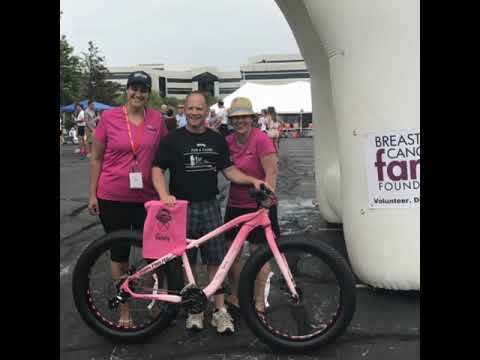 Proceeds of the Titletown Bike Tour benefit The Breast Cancer Family Foundation, who provides cancer awareness and prevention presentations to over 10,000 Wisconsin students annually. The Titletown Bike Tour is one of the many ways The Breast Cancer Family Foundation is inspiring people in our community to lead cancer-free healthy lifestyles! You can start any time between 5:30 am and 9:30 am. To reduce congestion on the roads and afford flexibility to the participants, there is no "mass start" to this event. We do encourage you to plan according to your anticipated pace and your target finish time. All riders should finish by 3:00 pm since the post-ride dinner ends at 4:00 pm. Both Saturday and Sunday's event will take place at 3100 AMS BLVD, Green Bay, WI 54313. The rides will start out of Parking Lot D. All participants will use lots C1 & C2for their event parking. The course routes for the Titletown Bike Tour are on public roads which remain open to motorists during the event. All riders are expected to follow the rules of the road. This includes recognizing that motorists have the right of way. Riders should stay on the right shoulder of the road and as much as possible ride single file, especially when motorists are present. Crossing the centerline of the road is strictly prohibited. All participants must wear a ANSI approved bike helmet at all times while on the course route. Violation of this rule will result in future ineligibility to participate. Riders are free to ride at whatever pace they desire but are urged to exercise caution during any downhill descents. Ride within your abilities and SLOW DOWN on the descents. I rode TTBT for the first time in 2016 as part of my training for my first Half Ironman. It was a challenging course with hills and plenty of support! Diane G. has run 1 times 2/4 found this review helpful. Larry B. has run 2 times 1/1 found this review helpful. View all Titletown Bike Tour reviews. Raceentry.com also cannot attest to the validity of individual Titletown Bike Tour reviews. All of the information about the race has either been supplied by the event staff or can be modified at any time by their race management. 2019 Titletown Bike Tour registration details are only as accurate as the event has made them.